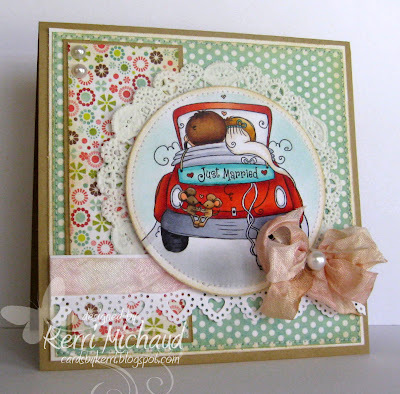 PaperWorks Co. New Release Blog Hop! Hello! Love is definitely in the air today as we hop along to show you the brand new Rachelle Anne Miller images available at the PaperWorks Co. Store! Hopefully you arrived here from Janet's Blog, but if not then start at the beginning which is the PaperWorks Co. Blog! I used this darling image called "Happiness is a Piece of Cake" and made my first ever center stair step card! The dp is some really old Melissa Frances paper that I had in my stash and the sentiment comes with this sweet image. I made a fun little card using probably my favorite image from this release called "Driving to a New Beginning". The dp is some fab My Mind's Eye Lime Twist Life of the Party. Kerri: http://www.cardsbykerri.blogspot.com----> You are here! We can't wait to see what color challenges you choose to tackle for your chance to win the release and the July PaperCard Kit! Thank you so much for stopping by today and enjoy the hop! Loving the sage and ivory. I would love to see what your wedding photos looked like. Such delicate work you have created here. Love the first project with all the layers and flowers. The car is my favorite image this release. Wonderful shading. Wow! 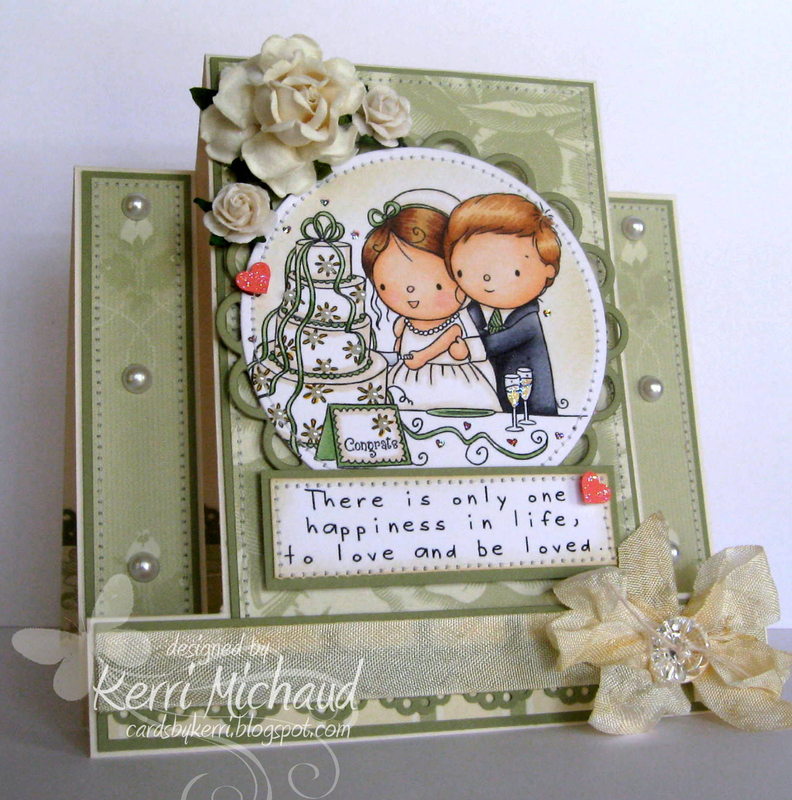 Kerri, these two cards are just gorgeous! Your sage & ivory coloured card is stunning ... such delicate detailing with the pearls and flowers and I love the style card you chose to do! Just beautiful work! Your cards are magnificent, Kerri! I love your coloring! You did a great job at that center stair creation -- the colors and elements make such a regal and divine card. And the different textures on your second card are amazing as well! The sage w/ivory is a winner to begin with, but then the adorable images make this over the top gorgeous! LOVE all the many details you put into this beauty! So beautiful card Kerri,I love the images and the colours. Gorgeous! I love your cards! Your stair step card is so elegant Kerri. And the second card is also lovely. You've done a great job showcasing these new images. Bot cards are beautiful Kerri. Your colouring is wonderful! wow! these are gorgeous, Kerri! beautiful coloring and details. fabulous work as always! These are adorable wedding card, very pretty with the laces and trims. beautiful all in one.